Head over to So Lo La' Deals to score $30 worth of Envirovogue merchandise for only $15! Envirovogue specializes in fashionable and eco-friendly tote bags, lunch sacks and more. They also have tablet and iPhone cases. I picked out a few of my favorite items below, but there are tons more! Make sure you check out their sale section...prices are as low as $3.95! 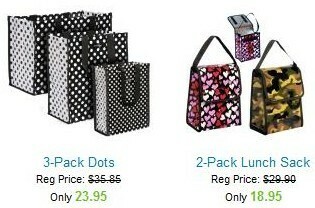 Click here, and then click the Daily Deal tab on top of the page to find this deal on Page 2!